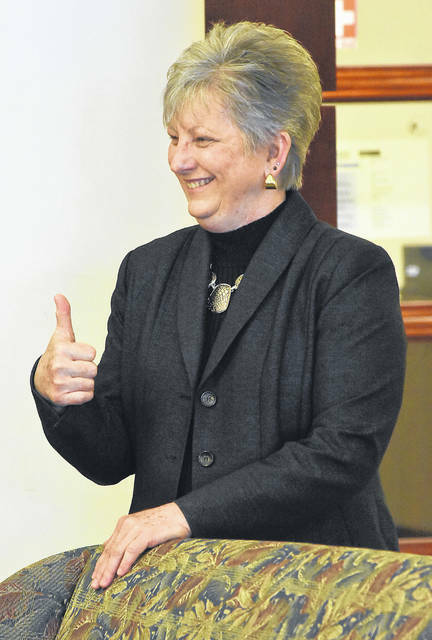 Dr. Cynthia Spiers gives a thumbs up while being introduced as the interim president at Rhodes State College on Wednesday morning. Spiers had been the special assistant to the president at Rhodes. She previously served as the vice president of student affairs and as director of institutional effectiveness and planning there. Dr. Cynthia Spiers addresses the media after being introduced as the interim president at Rhodes State College. 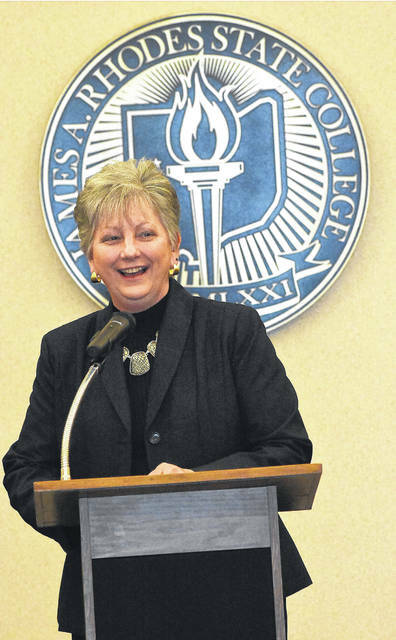 LIMA — Debra McCurdy, president of Rhodes State College, leaves the Lima campus this week as she transitions into a new job with Baltimore City Community College in Baltimore, Maryland. She served 12 years as the Rhodes State College president. At a news conference Wednesday, board president Dr. Wilfred Ellis announced that Cynthia Spiers will serve as interim president until a permanent one is appointed. She was the special assistant to the president at Rhodes. She previously served as the vice president of student affairs and as director of institutional effectiveness and planning. “I came back to help with the Higher Learning Commission (visit in March), and I came back on a temporary basis, got hired permanently as a special assistant, and then she (McCurdy) made her announcement (to leave in October),” Spiers said. She would not comment if she is seeking the job on a permanent basis. “I’m actively pursuing my next phase. How about that?” she said. Ellis said last month the college had begun advertising its president’s position in higher education journals. The college is also in the midst of work for its planned Center for Health Science and Education and Innovation in downtown Lima. As for the challenges facing Rhodes State College, Spiers says it’s similar to what all campuses face. McCurdy’s last official day on the job was Wednesday, but she expected to come in for a while Thursday to tie up some loose ends and finish cleaning out her office. McCurdy is confident Spiers can handle the role of interim president.